The president said the contract service campaign was a success. 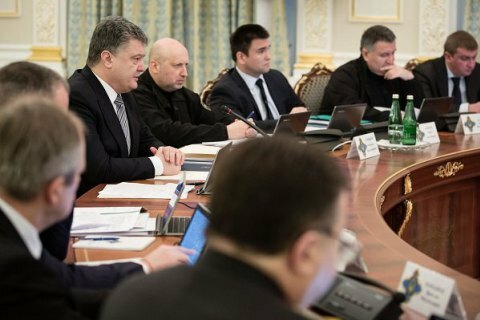 Ukrainian President Petro Poroshenko has signed the decree to demobilize servicemen of the fourth round of enlistment. According to the president's website, he announced this at the meeting of the National Security and Defence Council on 25 March. "I would like to start with the good news for 45,000 servicemen defending our country in difficult conditions. I mean the servicemen of the so-called fourth round of mobilization. I have signed the decree on demobilization of servicemen enlisted by the decree dated 21 July 2014 and the decree dated 14 January 2015," he said. He pointed out that this decree would in no way affect the high defence capacity of the state or lower the number of troops deployed in the east or along the Crimean isthmus. "The state will do its best to provide the Armed Forces and other uniformed units," he said. He said the contract service campaign was a success, predicting that around 14,000 contracts would be signed since the beginning of the year. Around 10,000 are expected to be mobilized during the seventh round.